Matrix II K is the standalone acccess control system controller and combines functionality of the controller and reader in a single case. 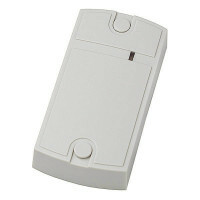 Matrix II K controller is perfect in cases where there is no need to install the controller separately from the reader. It's designed for managemanet of the electromagnetic and electromechanical locks. Matrix II K controller allows you to connect the reader or the exit button, the electromagnetic or electromechanical lock, external buzzer, external LED, door opening sensor.